Hi all. We hope the sun has brought some joy to your weeks and a smile to your face! We are back after spending much time at the Beardy Folk Festival (which we will tell you about very shortly), because after all it is still festival season! Today we would like to introduce a number of artists who sat down and had a bit of a chat with us about the upcoming “Underneath the Stars” Festival. 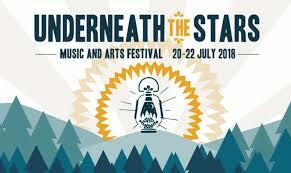 What is “Underneath the Stars”? Well, “Underneath the Stars” cannot really be considered apart from the efforts of Joe Rusby (and others), and singer Kate Rusby who always forms a part of proceedings. For many, folk music has always taken pride of place in the heart and never ceases to illuminate the top shelf of the CD rack (or now maybe the top disc of your computer hard drive!) But for others later to the game, it can seem a genre with a difficult way in. Kate Rusby is many people’s way in, and it’s hard to see why not. Great vocals, singing voice and arrangements truly warrant her moniker of the “Barnsley Nightingale” and this year along with many, many others they will entertaining at Cinderhill Farm near Barnsley. Check out their website above and get yourself there, its a lineup of kings and for us a special occasion so quintessentially South Yorkshire. We start by having a brief chat with Pitou, an intelligent music adventurer. Dutch-born with a palpable sense of experimentation in emotion, the Independent described her as “One of the most arresting voices to emerge out of 2017, Amsterdam-born artist Pitou has earned comparisons to singers such as Laura Marling and Julia Holter thanks to her intelligent brand of folk-pop.” There is something intriguing here, like the delight of a sharp, glass figurine that catches the corner of your eye in a room full of porcelain we have high hopes as she crosses the sea to share her vulnerable, exploratory music in South Yorkshire. Pitou will be performing on the Little Lights Stage on Friday 20 July. Pitou: My name is Pitou, I am from Amsterdam, and I will be playing at Underneath the Stars with my wonderful band. We can’t wait to play. Pitou: My first answer would be: Please Come Look For Yourselves. It’s always kind of dreadful to try and squeeze your music into a couple of words. But let me try again. Folkpop, Harmonies, Emphatic, Human, Delicate. Pitou: We do a couple of acapella songs. That’s always a special moment in the set. I’ve sang in a classical children’s choir when I was young, and these songs are a way of showing how wonderful just voices can be – but to a completely different stage and to a different audience. Pitou: We are looking forward to pretty much everything – the road-trip (we are coming from Amsterdam, and playing in London the day before), the sightseeing, but mostly the performing itself, and meeting new people. Pitou: My drummer was beyond excited when he found out that we are playing on the same stage as Steve Earle & The Dukes. Pitou: We will play some really nice festivals, and I am already working on new music, which I’m really excited about. Right now we are starting to play abroad more and more – and it’s wonderful to see all these different places, whilst discovering that the people that come and listen are not that different from each other. In a very beautiful and positive way. Rock and Roll never goes out of fashion.. and quite rightly so. Taking elements of Rockabilly, Country and Blues and mixing it across their original set, Howlin’ Rick reaches back in time and tickles the nostalgia of yesteryear. From what we’ve heard it’s got legs.. and they want to move. Eschewing an homage and instead bringing something that sounds quite fresh and with solid workmanship we spoke to the Leeds multi-instrumentalist ahead of the festival. Howlin’ Rick & The Rocketeers will be performing on the Little Lights Stage on Friday 20 July. HR&TR: We are a five piece Rhythm n Blues band from Yorkshire. We play original material and try and keep it rooted in mid-50s Rock n Roll & RnB. Most of our time is spent travelling up and down the UK playing our set at Rock n Roll clubs, bars and Rockin’ Festivals. HR&TR: Original Rockin’ Rhythm & Blues. HR&TR: The song of the moment for us is our new song “Lovin’ Days Are Through”. Got an RnB/Gospel feel. It’s going to be released in November as our first single. HR&TR: This festival has a great reputation. Everything from looking after the artists, the quality of the stages, sound team and last but not least how up for it the music loving audience is! HR&TR: Next up we are playing more festivals but one of the most exciting things for us is our first single coming out in November followed by our first album in Spring/Summer 2019. Folk music through and through, the Melrose Quartet are high profile indeed within these beautiful fields of traditional music that are soon to be filled at “Underneath the Stars.” We cannot do much but sing their praises, and also point out they were one of the few lucky groups to win one of our “Halo of Folk” Awards this year (listen to our award podcast at www.folk-phenomena.co.uk). We spoke to Jess Arrowsmith (on fiddle) about the upcoming festival. The Melrose Quartet will be performing on the Little Lights Stage on Saturday 21 July. Jess Arrowsmith: Melrose Quartet are Nancy Kerr, James Fagan, and Jess & Richard Arrowsmith. We’ve been good friends for a long time, and all are established performers with quite a range of other projects, but the band came together after ending up living on the same street and having babies at the same time as each other, spending a lot of time hanging out together singing and playing socially, and realising that the combination of all four voices plus two fiddles, box and bouzouki was a bit magic. It is one of those bands that feels like considerably more than the sum of its parts, and we genuinely have enormous fun making music together. Jess Arrowsmith: Lively, rich, uplifting, harmony, magic. Jess Arrowsmith: Such a difficult question! That is like asking us to choose a favourite child!! If we are only allowed to pick one then probably Dominion of the Sword (17th century words with the snap of modern rap, put to a gutsy traditional Breton tune by Martin Carthy in the 1980’s – always gets the adrenaline going.). Jess Arrowsmith: Playing and singing for a new audience – none of us have been to the festival before. Jess Arrowsmith: Never seen Steve Earle live before but have listened to his music for a long time, so that is pretty exciting. Jess Arrowsmith: Lake District Folk Weekend 3-4 August, Dartmoor Folk Festival 10-11 August, Whitby Folk Week (where we are patrons) 18-24 August. One of our most anticipated acts for “Underneath the Stars” is John Metcalfe. We can’t put our finger on it, maybe its the trip-hop influence on the song “Wrapped”.. or the slight breakbeat inflections of “Sycamore”.. or maybe it’s just the pure sleeves of talent on these performers but we are loving the soundscapes and departure from the bound and usual. Either way they are on our horizons, and should be on yours. Check out our brief stop and chat. John Metcalfe will be performing on the Little Lights Stage on Saturday 21 July. John Metcalfe: We like a small tequila after the show. John Metcalfe: Dolphin, Tree, Copper, Dusk, Dopamine. John Metcalfe: The lights going down just before we play. John Metcalfe: Everyone we can! John Metcalfe: New album release and producing a new album for Ben Murray and Rosie Doonan. With her quanun in arms and the drive for bringing peace through music, Maya Youseff is very curious indeed. She has played in Syria, at the proms and now she is playing at “Underneath the Stars.” Playing in opposition to Syria’s troubles, she is a truly great, original and ethical pick for the festival and we look forward to the event that her set absolutely will be. Maya Youssef will be performing on the Planets Stage on Sunday 22 July. Maya Youssef: I am a dreamer, a bringer of peace, and a rebel. The ‘proper’ way to describe myself is a Syrian qanun player and a composer based in London. The qanun is a 78 stringed- plucked zither often referred to as the piano of Arabic music. Maya Youssef: Alchemical, heartfelt, intense, joyful, eye-opening. Maya Youssef: That changes from time to time. Currently it’s ‘Queen of the night’ because it’s the most uplifting mischievous track on my album Syrian Dreams. Maya Youssef: I love myself an intimate festival … the people, Yorkshire…I would say pretty much everything! I; Who else are you looking forward to seeing perform at the festival? Maya Youssef: Kate Rusby. I am also looking forward to discovering some new music. Maya Youssef: Two gigs in Ireland including one at the National Concert Hall, Dublin and then my UK Autumn tour in some pretty epic venues. So there you go. Five artists and groups, five different voices and messages.. all in once place. Get yourself there and get a ticket. Stay tuned for our second round of interviews.. coming soon!